Fewer than 900 mountain gorillas exist today. Mountain gorillas remain exceedingly endangered and live in only one area—the Virunga Heartland. This landscape spans the Democratic Republic of Congo (DRC), Rwanda, and Uganda and is often threatened by civil unrest and violence. As a result, gorillas face threats from not only poaching, habitat loss, and fractured populations, but also from residual upheaval from human conflicts. Rangers protect and monitor remaining mountain gorillas. Habituated families of mountain gorillas are carefully monitored on a daily basis by rangers to ensure that neither poachers—nor human disease, an equally dangerous threat—strike. African Wildlife Foundation, through the International Gorilla Conservation Programme (IGCP, a coalition of AWF, Fauna and Flora International, and WWF), has trained rangers to record a variety of information such as data on various species and the evidence of habitat-destruction activities like logging and charcoal burning. Trackers and rangers are also trained to monitor the health of each group member; record births, deaths, and transfers of individuals between groups; and collect data on gorilla behavior and activities. 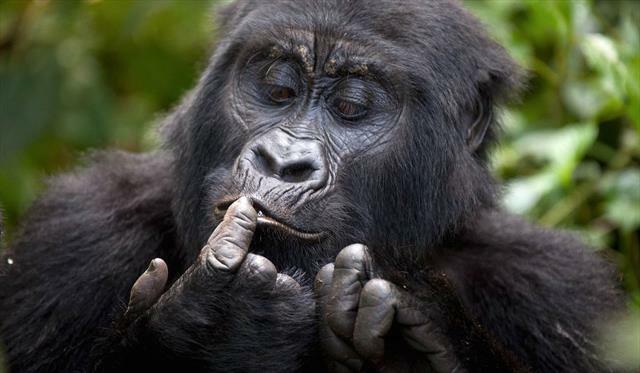 They record the daily location of the gorillas and clear gorilla habitats of snares set up by people hunting antelopes.